Here’s a question to ask yourself. the most in your studio? of time while working in your studio? what would you do during that week? instrument, what would it be, and why? It all comes down to what you’re GOOD AT and what you’re PASSIONATE about. If you want to make some sweet music in your studio, make it a point to focus on THOSE things as much as possible. For me, I love producing great arrangements of songs. And I love mixing those arrangements. I DON’T love editing. Sure, it’s a helpful tool, but the process of sitting down for a couple hours and editing a bunch of tracks does NOT excite me. On this latest album I did almost NO editing. I probably spent a total of an hour editing for the ENTIRE album. Instead of relying on editing, I focused on capturing great recordings. There were a few spots where the guitar needed to be “cleaned up” to be more in time with the drums, and I fixed the most obvious issues. But any other small timing issues? I left ’em ALONE. Is the album perfectly “polished”? Is every track perfectly edited and lined up on the grid? Does the album sound great? Sure, but it would have bogged me down SO MUCH…it wouldn’t have been worth it for me. I put my focus on things that excite me: producing, recording, mixing…and the album benefited from it. There are moments where the vocal is a little out of tune. To me, that leaves some humanity in the recording. When everything is pristine and absolutely perfect, sometimes it feels less real, less human. I think I landed pretty squarely in the middle. You can hear it for yourself. 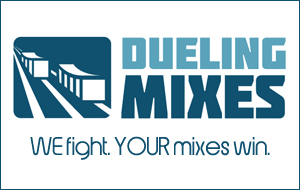 This month’s song over at Dueling Mixes (www.DuelingMixes.com ) is my version of the old hymn “It Is Well.” You’ll hear plenty of imperfections as you work on your mix, but I think you’ll also hear the soul and humanity of the MUSIC. After all, mixing and recording are GREAT things, but ultimately it’s all about the music.